At Aerie House the amenities are abundant and complimentary with offerings including a full breakfast, WiFi and internet, bay view hot tub and sundecks, parking, bicycles, airport and pier transfers and even welcome champagne. You’ll find everything you need to make your stay an enjoyable and pleasurable experience, just ask! 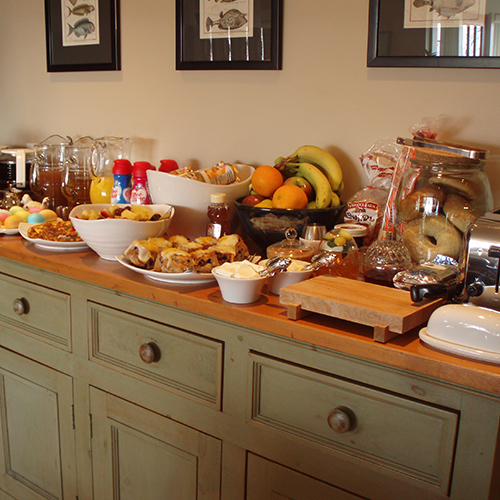 Our sumptuous breakfast is served daily from 8:00 AM to 10:00 AM and is included as part of our room rate. Breakfast is not offered during the winter midweek special. When the weather is conducive, we serve breakfast outdoors on our large second floor deck, which allows our guests to enjoy our panoramic bay view as they start their morning. The menu changes daily and includes a variety of hot dishes, baked goods, an assortment of cereals, fruit, yogurt, bagels, hard-boiled eggs, juices, coffee and tea. We also offer The Boston Globe, The New York Times, and The Wall Street Journal so you can remain in touch with the real world if you desire. We even have our own beehive on our grounds and are proudly serving the freshest honey one can find! Airport/Pier Rides – We offer complimentary pick up and drop off rides between the Provincetown airport/pier and Aerie House with 24 hour advance notification. 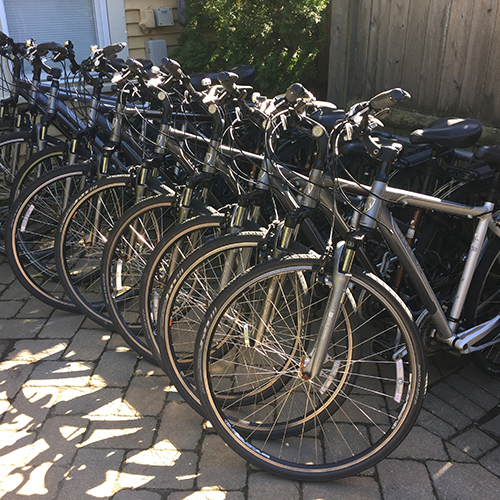 Bicycles – From Mid April until Mid October, we offer a fleet of house bicycles, during daylight hours, which are available to guests at no charge on a first come basis. Locks and helmets are also provided. We also provide secure bicycle racks for those who prefer to bring their own bikes. Provincetown is located at the tip of Cape Cod, Massachusetts, 116 miles from Boston. It’s between 2 1/2 – 3 hours by car, depending on the traffic. The Bus takes slightly longer or you can relax on the daily ferry (in season). Check out the links below for more detailed information and schedules. Cape Air – 800-352-0714 – The fastest way to Provincetown, just a 20 minute flight from Boston Logan Airport and seasonal nonstop service from New York/White Plains. Year-round, frequent, daily scheduled service from Boston. Jet Blue – Now connect through Boston to Provincetown from over 20 cities in partnership with Cape Air. Enjoy a single discounted through fare, checked bags through to Provincetown and simple connections within the same concourse at Boston Logan Airport. Must be booked through JetBlue. Boston Harbor Cruise Line – (The High Speed Ferry – 90 minutes) – 617-227-4321, Toll-Free 877-733-9425 – From Long Wharf in Boston. Plymouth/Brockton Bus Line – 508-771-6191 – Daily year-round bus service from Hyannis with direct connecting service from Boston and Logan Aiport. Peter Pan Bus – 800-343-9999 – New year round bus service from Hyannis with direct connecting service from Boston, Logan Aiport, Providence, New York and down the east coast. Amtrak Train to Boston – 508-771-6191 – Offering easy connections from South Station in Boston to both Ferry Companies and Cape Air. *Ferry Service begins mid May and runs through Columbus Weekend on both companies and then weekends only through early December on Bay State..
CD Player – Each accommodation is equipped with a CD player. DVD Player – Each accommodation is equipped with a DVD player. We offer over 1,000 DVDs in our DVD library, which is located off our Common Room area. DVDs can be checked out free of charge during office hours. Television – Each room has a color flat screen television with remote, cable TV and built-in DVD player. Internet – Complimentary Internet/WiFi available. Coffee & Tea – All rooms are equipped with a coffee maker and a supply of coffee and tea. Welcome Gift – You will find complimentary champagne in your room refrigerator upon your arrival as our welcome gift to help you unwind from your journey and kick-off your Provincetown vacation. 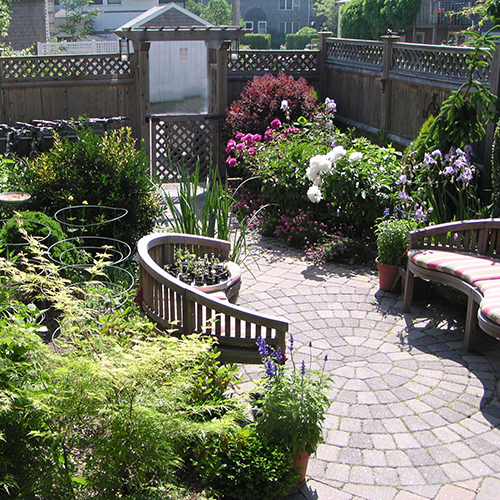 Beach – Access to Provincetown’s Harbor Beach is just a block away. Herring Cove and Race Point Beaches are located a couple of miles outside of town in the National Seashore Park and can be reached by bike, car or shuttle bus. 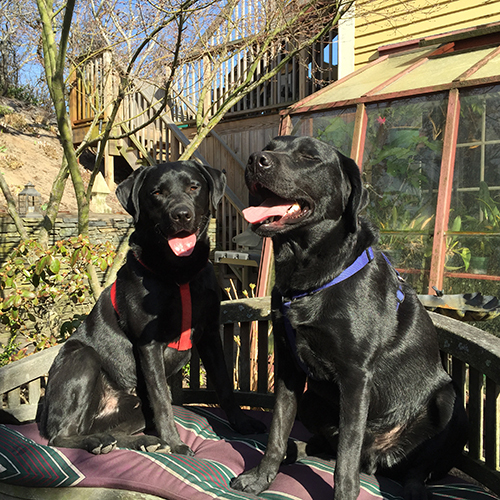 Dogs – We are very dog friendly and have two black Labs ourselves! View our Policies Page to learn more. Fireplace – The Guesthouse living room has a large wood-burning fireplace. During cold winter weekends we keep a fire burning for the pleasure of our guests. Guesthouse Rooms 1, 2, 4 and 7 have gas fireplaces for the use and enjoyment of their guests. 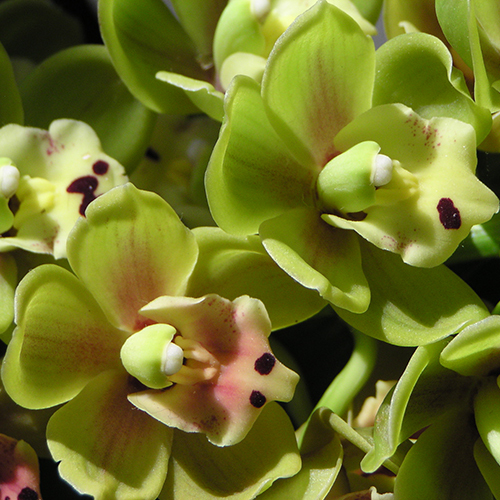 Gardens – Guests are invited to stroll among our extensive gardens which include over 25 variety of roses. Hot Tub – Our outdoor hot tub is situated so its occupants can take in a Bay vista as they unwind. The hot tub is available year round between the hours of 8:00am and 10:00pm for our guests to enjoy and is particularly wonderful on snowy winter days. 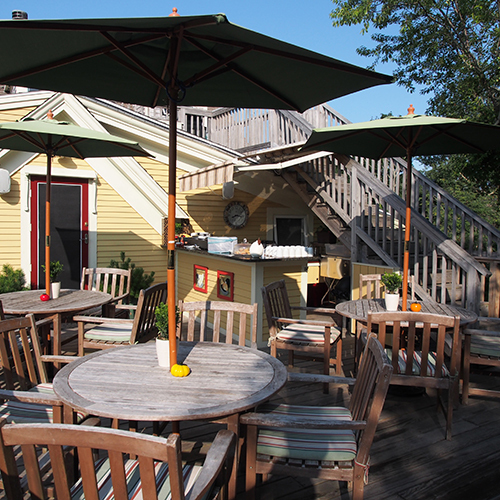 Sundeck – We have a large, private sun deck with tables, chairs and chaise lounges which offers a panoramic view of Cape Cod Bay and is the perfect place to enjoy a late afternoon wine after your day at the beach. Aerie House has entered into a partnership with Jonathan Williams Salon & Spa offering our guests preferred customer discounts on the full array of spa and salon services offered. Pamper yourself with any of Jonathan Williams Salon & Spa’s unparalleled range of facials, body treatments, manicures, pedicures, massage, full spa packages and complete salon services in their newly expanded facilities just a few blocks from Aerie House. For 2019 Aerie House guests enjoy a 10% discount on all massage and other spa and salon services. Visit www.jonathanwilliamssalonandspa.com to view the complete range of products and services offered and make your appointments online. Be sure to indicate you are a guest of Aerie House to receive your preferred rate. A visit to Jonathan Williams Salon & Spa is the perfect way to refresh, reward and rejuvenate yourself during your stay in Provincetown.